The blog of Andy Lang, bestselling author of contemporary fiction, adventure and suspense, epic fantasy and science fiction. 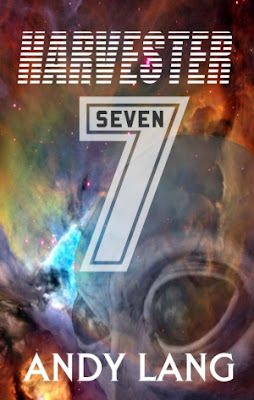 Harvester 7 is Free to download for a while, so get your copy of this Sci-Fi Introduction now. The genetic secret to all life in the universe revealed, and so begins the countdown to Armageddon. For over seven hundred and fifty years the harvesters had been voyaging into deep space, but each journey was becoming longer and more dangerous, because suitable planets were getting fewer and more difficult for the scouts to discover. Terrillia was a dying planet and nothing could be done to prevent the inevitable. Master Maulik carried the responsibilities of feeding his race with pride, and he performed his harvesting duties with diligence and compassion... yet his heart longed for adventure. But it is often dangerous to long, for sometimes the heart receives that which it desires most, and Maulik finds himself plunged into a game of political intrigue and brinkmanship that could alter the balance of power in his galaxy as rival species form an uneasy alliance. For the ultimate doom approaches. And as opposing factions draw together he finds himself a pawn in the great game, his only true ally, his new found friend, the Kressa. Discover how the story begins, the preparations for war, deceit and double dealing, plans within plans, the strangest of friendships... and an entire race reduced to the status of livestock.